My goal in my “basics” series of posts is not just to introduce the most elementary topics in optical science, but also to give background on some of the more advanced concepts for future reference. Much of my own research, and consequently my blog interests, center on nano-optics — the study of the behavior of light on scales much smaller than the wavelength of light — and one specific aspect of nano-optics that has grown tremendously in importance over the past ten years is the concept of a surface plasmon. Broadly speaking, a surface plasmon is a traveling wave oscillation of electrons that can be excited in the surface of certain metals with the right material properties. Because a plasmon consists of oscillating electric charges, they also have an electromagnetic field associated with them which also carries energy. There’s a lot of terminology to explain in that short definition, and in this post I’ll explain what a surface plasmon is, the properties of surface plasmons, and how those properties make them useful in nano-optical applications. The induced charges on the surface create their own induced electric field that tends to cancel the applied electric field within the conductor. Electric fields tend not to penetrate very far into metals, and this observation forms the basis of the Faraday cage. The electric field of visible light oscillates extremely rapidly — roughly cycles per second — and this field sets the electrons in the metal oscillating, mostly near the surface. Generally, these electrons just vibrate back and forth, but under the right conditions (to be discussed below), the light wave can excite a longitudinal wave of electrons. This electron wave produces its own electromagnetic wave, though this plasmonic wave is confined to a very small region near the surface, and exponentially decays away from it (indicated schematically in the right-hand side of the plasmon figure above). This wave of electron density and its associated electromagnetic field is what is referred to as a surface plasmon. 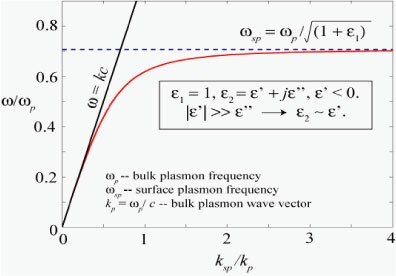 The term “plasmon” is chosen both to suggest that is it an excitation in an electron plasma and also to indicate its quantum nature — just as a “photon” is a quantum of light, a “plasmon” can be a quantum excitation of an electron plasma. This terminology is somewhat misleading, however, because surface plasmons in fact arise in the solution of Maxwell’s equations without the need to invoke quantum mechanics at all! 1) Field enhancement. As noted, surface plasmons have an electric field that is extremely localized to the surface of the metal. 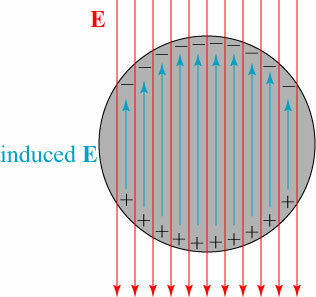 This “compression” of the electric field results in plasmonic field amplitudes that can be two orders of magnitude larger than the electric field that excites them! This field enhancement is implicated in a very unusual phenomenon known as surface enhanced Raman scattering (SERS), first experimentally observed in the 1970s. Raman scattering (without the “surface enhanced”) is the inelastic scattering of a photon (light quantum) by an atom or molecule in which some of the vibrational, rotational, or electronic energy of the matter is removed or added to the photon’s energy. The corresponding frequency shifts of the scattered light is practically a molecular fingerprint and can be used for material identification; unfortunately, the Raman signal is typically very weak, requiring large amounts of material in order to make a conclusive identification. 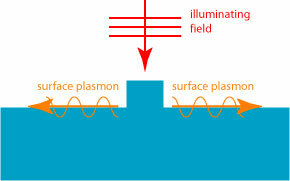 In the 1970s, however, researchers noticed that the Raman signal from molecules deposited on plasmon-supporting metal surfaces was orders of magnitude larger than expected; this has been partly explained by the field enhancement of surface plasmons (though there is not a completely satisfying explanation of SERS, even today). 2) Long-range propagation. As I’ve noted, light does not typically penetrate very far into a metal — typically on the order of nanometers. (This distance is referred to as the “skin depth” of the metal.) However, surface plasmons can travel along the surface of a metal over a significantly longer distance before being dissipated — even up to millimeters! That may not seem like a very long distance, but that is a million times longer than the skin depth. The effect is particularly pronounced when plasmons are propagating along a very thin (nanometers-thick) film of metal; as noted in the 1981 in a theoretical paper by Sarid³, the strength of dissipation actually approaches zero as the thickness of the metal film approaches zero. The long-range propagation property of plasmons is being employed by people interested in making a new, smaller generation of electrical and optical circuits. This expression may be also said to show that that energy is proportional to momentum for a photon propagating in vacuum. Ignoring the equations, we can see that this is a plot of the dispersion relations for light (black line) and a surface plasmon (red). For a given frequency (horizontal line), the wavenumber of a surface plasmon is always larger than that of a photon. 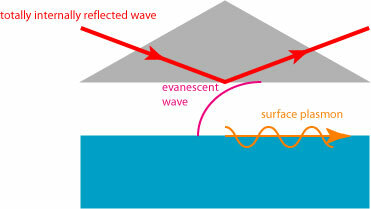 Because wavenumber is inversely related to wavelength, we may say that a surface plasmon has a shorter wavelength than light of the same frequency. This has huge implications for optical applications: for example, the resolution of conventional imaging systems is typically limited by the wavelength of light; reducing the wavelength is essentially an improvement in the system resolution. However, the different dispersion relation of plasmons has a downside. If we consider this relation in terms of energy and momentum, we may say that a surface plasmon always has a larger momentum than a photon of the same frequency. Because energy and momentum are always conserved, in order for a photon to be converted into a surface plasmon additional momentum must be provided. Light shining on a smooth metal surface will in consequence never excite a surface plasmon. This arrangement for exciting plasmons is known as the Otto configuration. The mismatch of momentum between photons and plasmons makes it harder to excite them, but it has an upside — a plasmon, once excited, cannot radiate back into a photon unless it hits another surface feature. Since the 1950s, theoretical results had established (as we alluded to at the beginning of this post) that very little light is transmitted through a hole of subwavelength size. Ebbesen’s team found, however, that the amount of light being transmitted through the holes was a factor of 10 larger than theory predicted. They attributed this anomalous enhancement to the presence of surface plasmons on the metal plate! It is a little difficult to explain why the presence of surface plasmons enhances light transmission in hole arrays; in fact, depending on the specific behavior of the system, plasmons can also make the transmission less than expected5. The short answer, however, is a combination of all three properties mentioned above. The field illuminating the metal plate excites plasmons at each of the holes. These plasmons travel to other holes and can interfere constructively with other plasmons as well as with the field directly transmitted through the holes. This resonance phenomenon enhances the field at each of the holes, where it is converted back into a propagating light wave. The observation of enhanced transmission, though initially controversial, opened researcher’s eyes to the potential of surface plasmons. The ability to squeeze light through a tiny hole made many nano-optics applications more feasible, and introduced many others (such as the plasmonic circuits mentioned earlier, as well as some schemes for producing invisibility). There is even a journal dedicated to plasmonics research, initiated in 2006, with the descriptive title of Plasmonics! The study of surface plasmons is now its own subfield of optics, within nano-optics, and holds significant promise for future technology. Only time will tell, however, whether the phenomenon will fulfill all the hype that has been heaped upon it! ¹Figure adapted from a classic monograph, H. Raether, Surface Plasmons (Springer-Verlag, Berlin, 1988). ² R.H. Ritchie, “Plasma losses by fast electrons in thin films,” Phys. Rev. 106 (1957), 874. ³ D. Sarid, “Long-range surface-plasma waves on very thin metal films,” Phys. Rev. Lett. 47 (1981), 1927. 4 T. W. Ebbesen, H. J. Lezec, H. F. Ghaemi, T. Thio & P. A. Wolff, “Extraordinary optical transmission through sub-wavelength hole arrays,” Nature 391 (1998), 667. 5 This is actually work that I was a co-author on: H.F. Schouten, N. Kuzmin, G. Dubois, T.D. Visser, G. Gbur, P.F.A. Alkemade, H. Blok, G.W. ‘t Hooft, D. Lenstra and E.R. Eliel, “Plasmon-assisted two-slit transmission: Young’s experiment revisited”, Phys. Rev. Lett. 94 (2005), 053901. I had a question regarding this if you don’t mind answering. When you talk about exciting surface plasmons using a photon by increasing the photon momentum by using a prism or gratings, what does that mean. Do you not need momentum matched light in the first place to form surface plasmons. Once these are formed, why do we need to excite them using additional light. I would like to thank you for your blog it helped me understand the basics of nano optics that forms the principle of SPR which as a biologist is a little bit far from my primary domain. You’re very welcome! That’s what I’m here for! moving from the coherence lounge to the plasmons lounge. I am familiar with what happens when a light wave hits a metal surface. A surface current forms on the skin of the conductor…..This is a classical result. Such current is a longitudinal motion of charge. the wave propagates along the surface and decays fast in the perpendicular directions…. How is this current different from a surface plasmon? Polaritions are quanta of the combined system of currents and fields….In what sense do the two currents and fields combine? What type of field is associated with a polariton particle? An electromagnetic wave incident upon a metal surface will of course form an oscillating current on the surface of the conductor, but in general this oscillating current only exists in the presence of the exciting wave field. That is: the current only exists where the light is shining on the metal. A plasmon, which only appears in metals with the right properties, is a true traveling wave: it will propagate away from the illuminated spot and carries energy along the surface! From a mathematical point of view, a surface plasmon can be shown to be a solution of Maxwell’s equations that exists independent of any exciting field, while a normal surface current requires that exciting field. As for polaritons: I don’t know! I’m not familiar enough with the quantum properties of polaritons to describe them in much detail. Presumably one photon gets converted into one plasmon, but beyond that I don’t know specifically how one describes the field/current of a single plasmon.